Life has been a little mundane as of late with all of my time being taken up with my job and working on a secret little project for my friend Sarah's birthday. (You might remember her from my Brighton and London posts!) However the other day I took a little trip (Well, if you call four ferries 'little') to the Isle of Bute with another of my friends from uni to explore the island since I haven't been there since I was around 6 or 7! Waking up extra early for the 08.50 ferry to take me across to Gourock left me time to scramble out of bed and grab a coffee on the way to the boat. Meeting my friend at Wemyss Bay we hopped on the 10.15 ferry to Rothesay which is the main town on the island. With a population of around 7,500 the island really comes alive in the Summer tourism season and plays host to various coach trips and day trippers as it is easily reachable from both Glasgow, Dunoon and Largs. Stepping straight off the ferry we popped into the Discovery Centre to say hello and grab a map. I had vigorously researched the bus times and had already attempted to plan our meals and schedule our day down to the last minute. All in an attempt to be more organised for when I head to Nuremberg however we shall see. 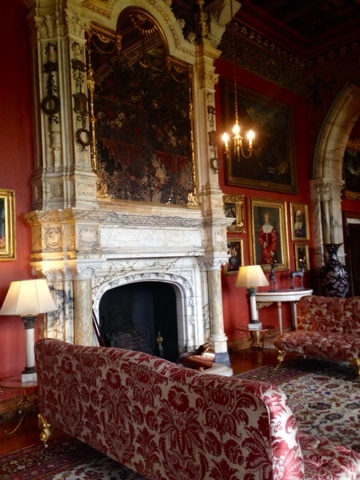 Our first stop was taking the 490 bus out to Mount Stuart, a beautiful red stone Victorian Mansion house roughly 20 minutes outside the main town of Rothesay. It is however most definitely worth the little journey out. With an incredible marble hall marking the entrance to the house, there are currently no barriers or cords marking out your path so you are free to wander from room to room and even sit on certain pieces of furniture! With the most beautiful furnishings, if you are a fan of estate houses or castles then it is definitely worth the extra money to have a look inside the house. I had been advised that the café was an excellent spot for lunch however when we arrived we discovered that in fact the café was actually only a tiny little room attached to the reception of the visitors centre which sold a basic selection of sandwiches and it was the restaurant which we were encouraged to go to. Unfortunately this is shut Monday and Tuesday so a cheese sandwich it was. We did however stop for a quick cup of tea and a scone at the main café in the house itself which enlightened me to the fact that I do not like clotted cream and I should probably remember that for next time. 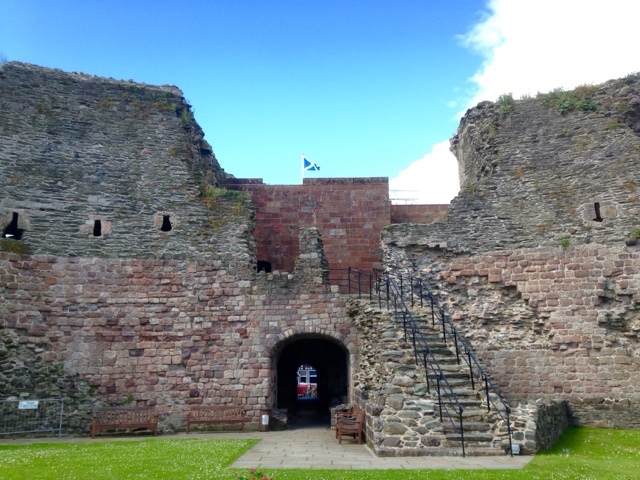 As a totally self acknowledged history geek and general castle-lover we couldn't not stop in at Rothesay Castle. My favourite kinds of castles are actually the ones which are what I like to think of as stable ruins - you can walk around them and climb up some of the stairs and there are visible rooms and different features yet are unfurnished and really just magical places to explore. I love walking around imagining what each room would have hosted and all the different stories of the amazing characters which lived there. Rothesay castle was no different. A few more information plaques wouldn't have gone amiss but my imagination was quite content. The prisoners pit was so well preserved that you could climb right down into it - really quite earie. That's all for my little adventurous day on the Isle of Bute. If you are ever in the West Coast of Scotland I would definitely recommend popping across to the island for the day. It's a beautiful little place with plenty of things to explore and see. Let me know in the comments if you have ever been to the island!